Racing- Mountain High Snowsports Club, Portland, Oregon ski club. • Great camaraderie • IT’S FUN! Since 1985, the PACRAT league has provided an exciting and fun opportunity to participate in recreational alpine racing on Mt. Hood. Never raced before? No problem, you will be grouped with other racers at your skill level. Need someone to ski with? We'll give you 9 companions for the season. Just sign up and you will be on a 10-person team. Any intermediate skier or boarder qualifies. Beginner racers contribute to the overall team score as much as advanced racers and maybe more. The PACRAT League is separate from our club. In fact, it is the result of cooperation between several clubs. Our club has participated from the very beginning, with at least 4 to 6 teams each year. In the past several years, we have had 12 - 13 (120 - 130 racers). Come if you are new to racing and/or bring a friend who might be interested in joining a PACRAT team. Open to everyone. $10 for 2 runs. $20 for unlimited runs down the race course. Print and fill the NASTAR Registration form. Captain's meeting - MANDATORY FOR ALL CAPTAINS - 8:30 a.m.
Open to anyone who wants to try racing. A Slalom (on Saturday) and a Giant Slalom (on Sunday). Click here for more detailed info and flyer. For anybody planning on racing Masters Mania this weekend, PNSA officials ask that you register with the website www.skiracereg.com . You can still pay the day of the race, it just helps the officials track the finances. We are planning to race on the West Mile (aka: Kipp’s Run), just off the top of the Magic Mile chairlift. We will meet in the Wy’East Day Lodge on the 3rd floor. This release is available online only, and all PACRAT racers must complete the liability release prior to the event. Discounted racer lift tickets are $48 with your PACRAT bib at the ticket windows. An event for those who qualify, based on previous NASTAR and/or PACRAT races. When the event gets closer, you will be able to see more details on our Mt. High Calendar. This date will be used only if a previous race gets cancelled and needs to be made up. Our end-of-the-year Rat Attack party is coming up on Friday, April 12. Fun races for the whole family. GS and Slalom. Note: Events highlighted in GREEN are NASTAR events. These are open to everyone and you can just show up on the day of the race. For all other events, you need to pre-register. PACRAT races are open to everyone, but you need to pre-register and join a 10-person team, and commit to a full season of racing (5 races). If you wish to race, contact any of our team captains or our Racing Director. General Description of PACRAT Racing - Find out how we race. PACRAT flyer - print it, and post it somewhere, or send it to a friend! Slide show presented at the Rat Attack Party: 2013 End Of Season Show. Please sign up digitally, online. Go to our Sign Up and Pay page to register for PACRAT Racing. Note that NASTAR races are open to the public. But PACRAT racing requires pre-registration. Each PACRAT race now also counts as a NASTAR race, and you can qualify for the NASTAR National Finals. Each racer will receive a NASTAR medal (either Gold, Silver, or Bronze) at the end of the season. To receive the benefits of both PACRAT and NASTAR, please register for both. Please sign up online, but if you need individual forms, they are listed below. For existing racers: If you have raced in NASTAR any time since 1997, you are already in the system and all you have to do is sign the NASTAR form each season. Just find your NASTAR number by searching for your name at www.nastar.com and update it with the PACRAT info below. Then please fill out the NASTAR Registration form shown under #4 in the PACRAT registration column. 1) Family/Friends = your Pacrat team name – eg. : Avalanche Express, Mixed Nuts, etc. 2) Club team = "Northwest Ski Club Council"
3) Resort Team = "PACRAT". Use the scroll arrow to select "PACRAT" for the resort team name. Print out and save this page for easier access to your results on the NASTAR.com website. NASTAR registration instructions PDF | Word. More details on all of the above. Print out these instructions to simplify your NASTAR online registration. and send them to your team captain. Print out these instructions to simplify filling and printing out the PACRAT registration forms. Racers fill out one line and send to team.captain. This form is needed for the ski areas. Each racer, sign on one line. This form is needed for our insurance.. Each racer, sign at the bottom. This form is used for our internal PACRAT records, while the online registration is used for NASTAR's records. We need your signature on this one. Fill out and give all these forms to your team captain or to our Racing director. Click here to see the Black Diamond Thunder collection of videos from Bruce Kuper's helmet cam. 2013 PACRAT Awards Slide Show, summarizing the whole season. Even if you have never dreamed of being a racer, give it a try. It's well worth it. It will enhance your social life, and improve your carving skills! Teams are usually formed by mid-November, so apply early! See instructions below. 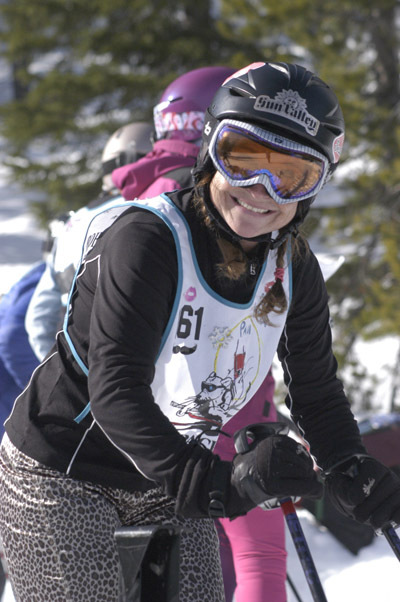 Each Friday during the winter season, there will be a GS Training clinic, mostly at Mt. Hood Skibowl and/or Timberline. Meet in the lodge by 8:30. Cost is only $35 (plus a lift ticket). Please RSVP to Coach Greg Dilger with of the Mount Hood Adult Ski Racing Association. The location might change due to weather and snow conditions. It will be at Ski Bowl when conditions permit. There is a third coach available this year to assist. All racers should contact a team captain, and sign up for a specific team. Each team consists of 10 racers. 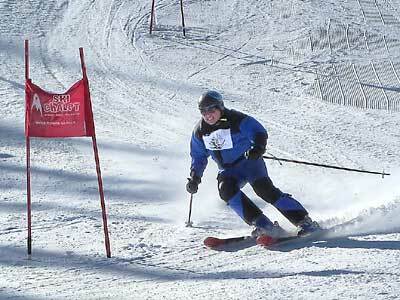 Discounted lift tickets for PACRAT racers can be purchased by showing your racing bib. 8:45 am - Brief team captains' meeting in the day lodge. 9:00 am - Start skiing--Warm up and inspect the course. 10:00 am - Race begins for the first group of racers. or ask to see a copy at the team captains' meeting in the lodge on the morning of the race. 3:00 pm - Apres ski party. Locations will be announced for each race. Open to non-racers for a small fee to cover the food and drinks. 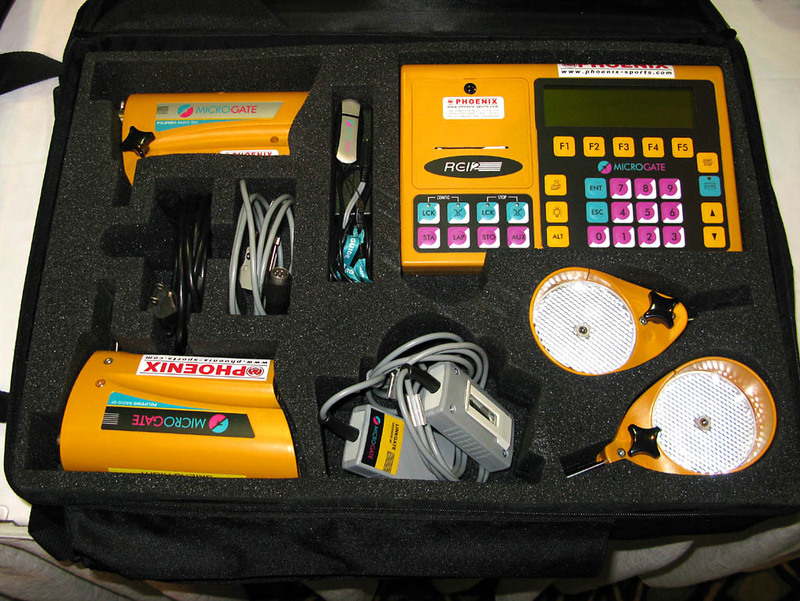 The PACRAT racing league has their own timing equipment. Less waiting for unreliable systems that they had no control over. 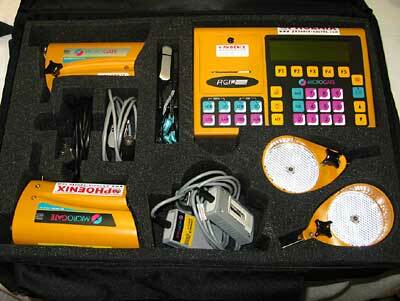 Below is the wireless timing system PACRATs uses: Phoenix Microgate. Click on image on right to enlarge it. 1. Click here to read more about PACRAT racing. General Description. 2. PACRAT flyer - Print it, and post it somewhere, or send it to a friend! 3. PACRAT Racing video - See how it's done, both the races and the après-ski parties. Remember, each team can have a maximum of 10 people, preferably of varying abilities, so even if you are a beginner racer, or have never raced, please don't hesitate to call us. We need you! All about: Eligibility, Teams, Classification, Scoring, Points chart, Handicap system, and Categories. Explanation of how the 7 categories (or classes) are determined, based on a person's handicap. Dale Parshall explains various racing rules and procedures, such as what happens if you forget your racing bib, if your ski falls off, if you miss a gate, or if there is interference on the course. Dale Parshall explains how the zero par times (ZPT) for our race courses are calculated. Diagram showing how to correctly slip the course. Diagram showing what it means to "start your turn early" and pick a faster line. Go to the "Race Results" page on our own club web site. POINTS: Everyone earns one point just for successfully running the course at least once. You earn 10 points for a first place in your category. 9 points for second place. 8 points for third place. The scale is adjusted depending on how many are in a class. BONUS POINTS: You get 3 bonus points every time you improve on your own best previous result, that is when you improve your best previous handicap. CATEGORIES: There are 7 categories for men, and 7 for women. The result of your first race determines which category you will be in. After that, when you improve to the point that your result lands in a higher category, you will be moved up into the higher category for the following race. But it takes 2 below par results before you would be moved back down into a lower category. UP-STRIKE: A letter "U" next to your name indicates that you have exceeded the results typical for your own category. Receiving even a single up-strike means you will be moved up to the next category. DOWN-STRIKE: A letter "D" next to your name indicates a down-strike. Your result fell short of what is typical for your category. If you receive 2 down-strikes (in 2 consecutive races), you will be moved to a lower category for the following race. HANDICAP: This number shows how you compare to the fastest theoretically possible time (the time a top World Cup racer would get) on any particular race course. If your handicap for a race is 10, then your time is 10 percent slower than the theoretical fastest possible time. Pace-setters with known handicaps are used to determine the theoretically fastest possible time. DNS: "Did Not Start" - if you do not start in a race. No points are earned. DNF: "Did Not Finish" - like if you fall and do not go through all the gates. A single point is still earned if you record a DNF and no time on a second run. Click here if you need Adobe Reader for PDF files.